For now it’s just a concept, but give it a few years and it could make it to production. With the debut of the 01 crossover last October in Berlin, and reportedly available next year in China (followed by the Europe and US – see picture/reveal video below), Lynk & Co also brought along with it a four-door sedan concept that took an extremely futuristic approach to its design… though you might have missed it. The dramatic front fascia and suicide doors previewed the upcoming design language of the brand. Though we only saw that concept briefly, we now get to see the car up close and in detail. Adamsky Management released 25 stunning images of the car for all of us to see, previewing an upcoming ad campaign that the company will be running on its social channels in the next few weeks. Apart from its unique design, we don’t know much about the concept. Lynk & Co hasn’t released any details about performance; our best guess is that there’s an electric powertrain under the hood. What we do know is that the Geely-owned automaker will produce five high-volume models based on the upcoming Volvo XC40 platform, with a production-version of the sedan concept pictured here likely to come after. The first car in the Lynk & Co lineup will be the 01 crossover. It uses the Volvo-developed Compact Modular Architecture, and stretches out to 178.4 inches (4.53 meters) long, 73 inches (1.85 meters) wide, and stands at 65.1 (1.65 meters) tall. The 01 will primarily target the Chinese market, and power will come courtesy of a range of plug-in hybrid and pure electric engines. The 01 crossover will go on sale in China later this year, and will be launched in the U.S. and Europe in the months that follow. Two new models will debut in the next few years, the “02” and “03,” with a sedan based loosely on the concept seen here eventually coming down the line. 16 Comments on "Lynk & Co’s EV Sedan Gets A Full Reveal, Looks Swell"
Looks great with the doors closed. 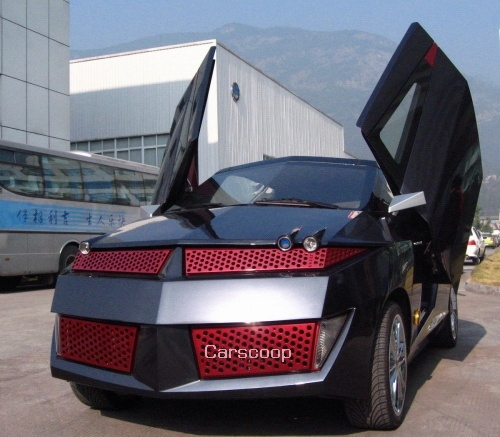 Why even bother with the ridiculous show-car doors. Jeeze. It’s not that they don’t understand, it’s more they are just sick of them. A concept car is intended to demonstrate design and/or engineering innovations as opposed to developments which are immediately applicable to mass production. I think pretty much everyone here understands that. However, there’s no point in demonstrating, yet again, something that’s already been demonstrated 100 times. There’s less point in demonstrating a feature where obviously the only point is to create sizzle rather than steak. A four-door with no “B” pillar; the entire side of the car opens up? No way would that ever make it into production, and if it did, it would be very unsafe in the event of a crash. From the linked previous article about Lynk, I see it’s a subsidiary of Geely, which used to be a small company making cheap three-wheel microcars, but I see they’ve now bought out Volvo, so I guess they grew up. That means Lynk has an established auto maker behind it, so Lynk might actually put something into production. But it’s hard to take them seriously with designs as impractical as this! Strange Doors have found us. Strange Doors have tracked us down. They’re hard to ignore, they are part of the ceiling, and go to the floor. It’s pretty cool how the transition to EVs is spawning a lot of new car makers. Obviously most will fail, but some will prevail – and at the expense of some incumbents. I tend to take this as further proof, as if that was needed, that EVs really do lower the barriers to entry in the auto industry. Which of course explains pretty well why the incumbents would like to see EVs go away… at the same time as they have to do the balancing act of trying to not look like public enemies and position themselves for a future that looks ever more certain to be based on electric propulsion technology, whether they want it or not. I hope this one finds its way to Norway. I’d never even heard of it before, so thank you for covering it! Geely is a 30-year old carmaker, with 18K employees. They made 800K cars last year (all ICE)… Not including Volvo, which they own. And EVs don’t really lower barriers to entry for volume cars — the major hurdle is scaling heavy-industry production (including supply chain, assembly, logistics, QA etc. ), not design. Both EV makers and ICE makers outsource most of the car, and that won’t change. If they keep the general design language and can get some muscle car performance like figures, while keeping the price competitive with the likes of the Camaro and Mustang, that could be killer. More like what I was hoping for from the Tesla Model 3.